The installation of Danone Waters Interoll heavy-duty gravity conveyors has streamlined the pallet handling of Evian water on platforms. At the end of the production line, automatic-guide vehicles (AGVs) transport pallets weighing 1.200 kg to the loading platforms. 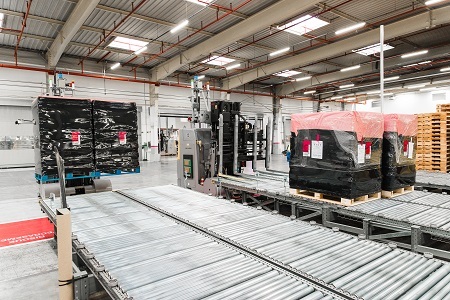 The AGVs move two pallets at a time and position them with pinpoint accuracy on sixteen-lane gravity conveyors (holding up to 27 pallets each). The gravity lanes direct the pallets to fork-lift trucks, which pick up four at a time and load them onto the trains. To ensure the safety of operators, the installation and goods, Interoll’s MSC 80 Magnetic Speed Control rollers maintain a constant pallet speed of 0.3 m/sec. At the end of the line, a mechanical separation system enables four pallets to be picked up at the same time. The proposed solution uses gravity, therefore the system does not need to be powered. Apart from a few components that are subject to wear and tear, it does not require any maintenance. The gravity conveyors generate no carbon dioxide emissions, which is important for a site which in 2017 became Danone’s first carbon-neutral site.